Below are common attributes associated to Crystal Falls Mondo Grass. Become a care taker for Crystal Falls Mondo Grass! Below are member comments regarding how to plant Crystal Falls Mondo Grass. No comments have been posted regarding how to plant Crystal Falls Mondo Grass. Be the first! Do you know how to plant Crystal Falls Mondo Grass? Below are member comments regarding how to prune Crystal Falls Mondo Grass. No comments have been posted regarding how to prune Crystal Falls Mondo Grass. Be the first! Do you know how to prune Crystal Falls Mondo Grass? Below are member comments regarding how to fertilize Crystal Falls Mondo Grass. No comments have been posted regarding how to fertilize Crystal Falls Mondo Grass. Be the first! Do you know how to fertlize and water Crystal Falls Mondo Grass? Below are member comments regarding how to deal with Crystal Falls Mondo Grass's pests and problems. No comments have been posted regarding how to deal with Crystal Falls Mondo Grass's pests and problems. Be the first! Do you know how to deal with pests and problems with Crystal Falls Mondo Grass? Looking for Crystal Falls Mondo Grass? Crystal Falls® Mondo Grass is a shade loving and cold hardy grass with dark, wide leaves that grow 24 to 30 inches long by one-half inch to three-quarters inch wide. Panicles of star shaped, white blooms 6 to 8 inches long appear from July through September. Following the bloom period, very large berries are produced which turn bright blue by November. This disease resistant plant was developed by breeder Bob Head and introduced into the market in 2010 as a part of the Garden Debut® plant collection. Crystal Falls® Mondo Grass performs best in a shaded landscape accompanying other perennials and shade loving plants. 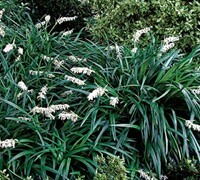 It withstands the cold and resists leaf spot that is commonly seen in Liriope. Crystal Falls® Mondo Grass is hardy in USDA Zones 6b-9 and can be used as a specimen or grown as a groundcover in shade. I plant Mondo Grass in sites that provide afternoon shade to mostly shade and well-drained soil. Mondo Grass is a great choice to plant as a groundcover under large trees or in other shady sites. It can also be useful to add a grassy texture in container plantings. Before planting Mondo Grass or other groundcover plants as a groundcover, it might be necessary to do some site preparation. First, you'll need to eliminate any weeds or grasses that are growing in the planting area. There are many ways to do this however spraying with a weed killer is easiest and most efficient. If you are planting groundcover plants under a tree, and intend to till the soil before planting, be careful not to till to deep and damage tree roots. Depending on how fast you want to the groundcover plants to fill and cover the area, I recommend spacing them about half the distance as their listed, mature width. If the plant is listed to grow 18 inches in width, space the plants 9 to 12 inches apart. Before planting, space all plants out in the planting area, or use marking paint to mark the planting spots. Begin by setting out a row of plants along the edge of the perimeter, making sure to space them at a distance far enough from the edge to allow for future spreading. For example, plants that are spaced 12 inches apart should be spaced at a distance of at least 6 inches from the edge of the bed or surfaced area. After setting out the first row, stagger the plants on the second row, and so on until you have filled the area. When planting between the gaps of closely-spaced stepping stones it might be necessary to divide the root ball of the plant to a size that will fit. After all of the plants have been set in place, or marked, you may begin planting. If you mulched the planting area in advance of planting, rake back a small area of the mulch in order to dig planting hole. To plant, dig a hole 2 times as wide, or more, than the container the plant came in. Mix in an organic soil ammendment such as mushroom compost at a 50/50 ratio with the soil removed from the planting hole. Remove the plant from the container and scratch root ball to loosen feeder roots. Place plant in hole making sure that the top edge of the root ball is level or slightly above the level of the ground. Backfill around the rootball with soil mixture tamping lightly as you go to remove air pockets. Water thoroughly and cover with a 1 to 2 inch layer of mulch if you haven't already done so. Mondo Grass requires no pruning however some people like to shear or mow it to the ground in late winter, BEFORE new growth starts to emerge. I fertilize Mondo Grass one time a year with a slow-release, well-balanced plant food when new growth begins to emerge in spring. I've seen no serious insect, pest or disease problems with this Mondo Grass. Consistently wet soil can cause problems with the roots. In the South, too much afternoon sun can fade foliage color and cause stress.